Forces in the universe conspired to have the East Village be the first stop on the NY Neighborhoods Project a couple of weekends ago. Circumstances kept pulling me out of our yuppified digs on the UWS, to show me an edgier side of the NYC. A visit from my friend Jesse – a NY to LA transplant—gave me the needed kick in the pants to get started. He invited me to join him and a friend for lunch down in that part of the city. They planned to shop-hop and pick up sandwiches from a couple of favorite places on 7th Ave and share. Obviously he had to twist my arm to go, and with three people we could cover more ground. I was amazed at the sheer number of delicious looking and affordable options lined up on 7th St. and St. Marks Place, between 2nd and A. By coincidence, the next night my friend Jason invited me to join him at a party about two blocks away from where we’d had our sandwich smorgasbord. This gave me a chance to see this area alive and hopping at night. 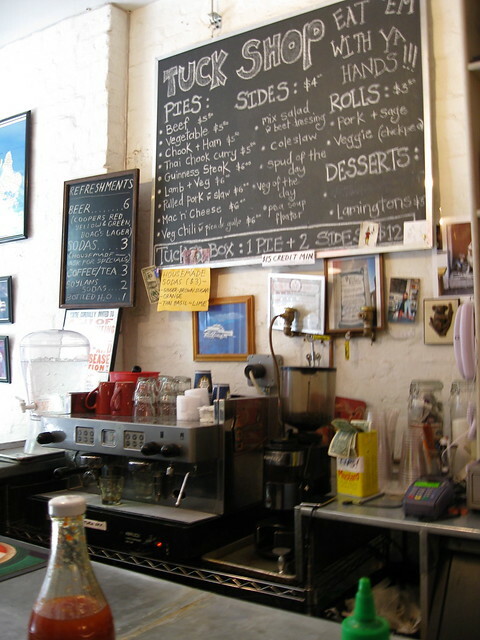 There are plenty of bars in the East Village where we could have kept the party going, but we were all starving after the party, so a late-night diner stop became necessary. The next day, Greg and I were both feeling the effects of our respective nights out. (He’d had a guys night.) Since there are more cheap hangover friendly eats down there than I’d be able to try in a year, we headed to the East Village one more time and then spent the rest of the afternoon taking pictures and soaking up the funky vibe. 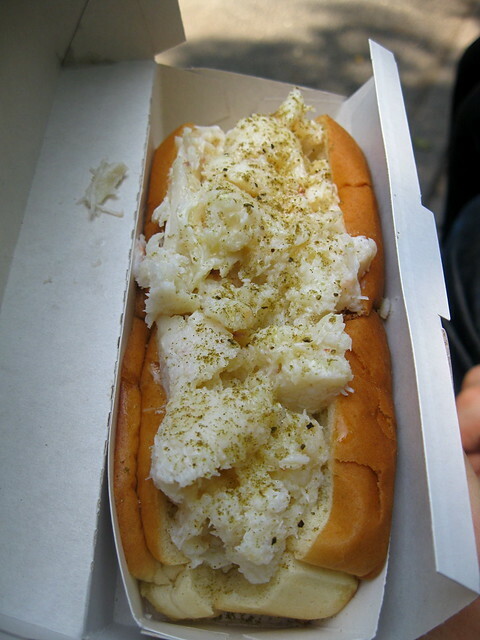 At $15, Luke’s Lobster Roll isn’t exactly cheap for a sandwich; however, you can taste exactly where your money is going. The rolls are piled high with huge chunks of sweet lobster meat that has been oh-so-lightly dressed so as to not detract from the flavor of the lobster. 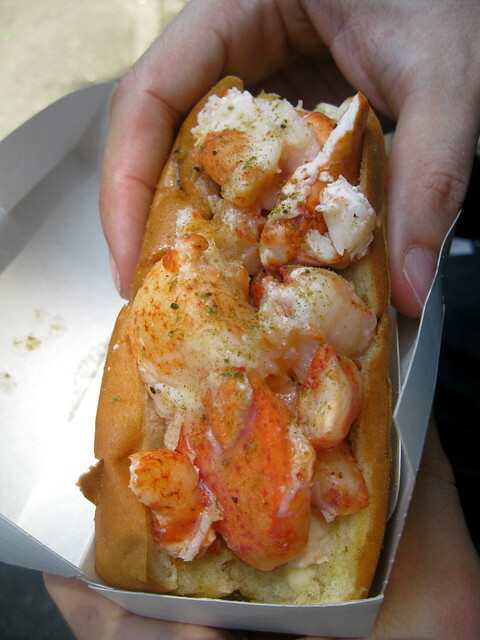 If you’re not in the mood to splurge for the lobster, the crab roll is also quite tasty for $5 les, and while I didn’t try the shrimp roll, that’s only $8. Since I arrived in NYC, almost without fail whenever I tell people that my family is Venezuelan, they tell me about Caracas; so when I saw it right next to Luke’s, I dove into to get one. I ordered the Arepa de Pabellón, which is filled with shredded beef, black beans, white cheese, and plantains. It’s a little like having home stuffed into one sandwich. By the time we sat down to eat, the arepa had lost some of its texture, however, the upside is that the juices from the meat had all soaked into the arepa dough. Yum! If you don’t know what an arepa is, check out my post and video. 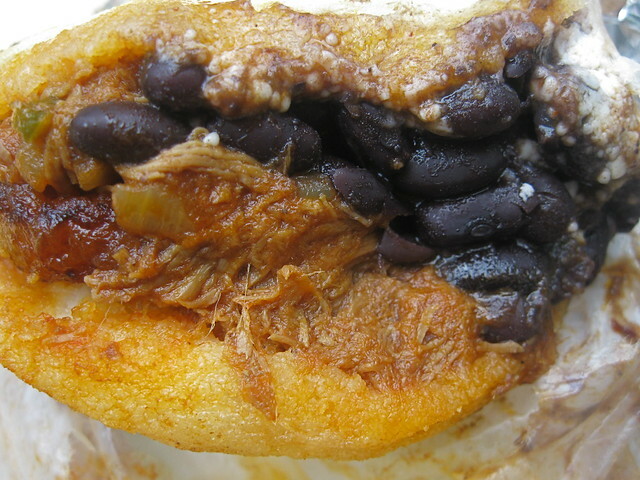 Also, click here and here to see my recipes for Pabellón. 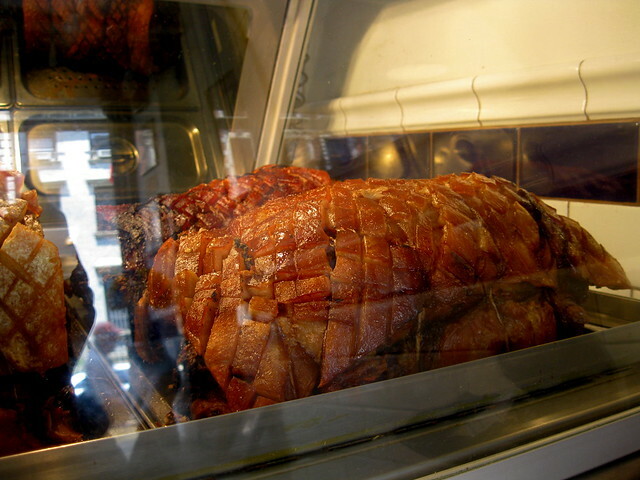 I don’t think I’ve ever been as instantly intoxicated by the smell of a place as I was when we first walked into Porchetta and the aromas of roasting pork hit like a wave. My mouth started watering immediately. The Porchetta sandwich is perfect simplicity – just roasted Niman Ranch pork on a ciabbatta roll – but that doesn’t stop it from being completely decadent. It was so good that after I tried one with Jesse on Friday, I had to take Greg back on Sunday. My first sandwich had more drippings, the second had more crackling – really you can’t go wrong either way. 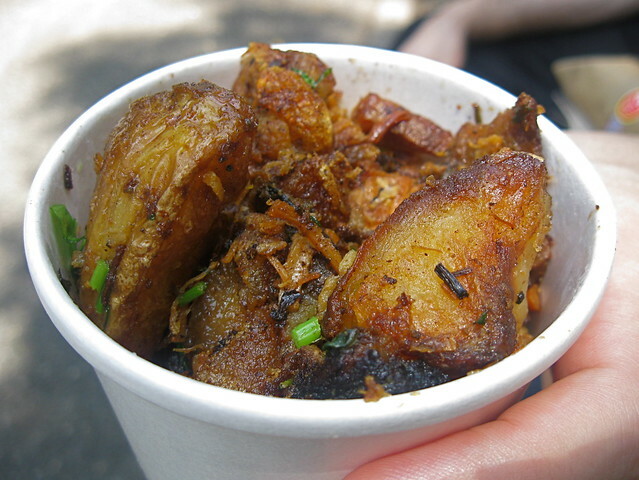 If somehow you didn't get your fill of pork on the sandwich, the potatoes are topped with crispy bits as well. 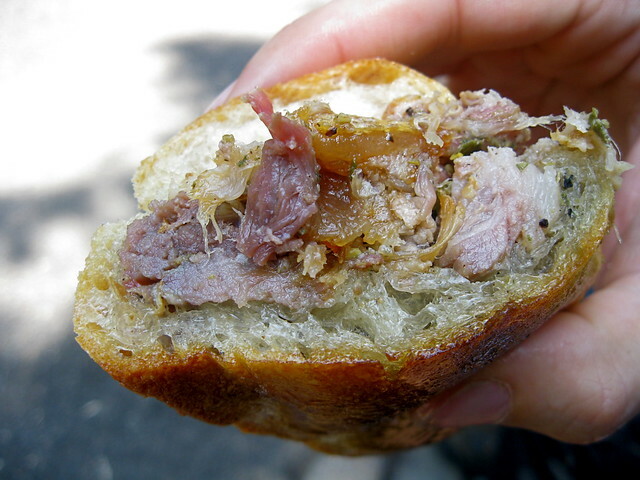 On their website they have a recipe for porchetta that I might just have to try. 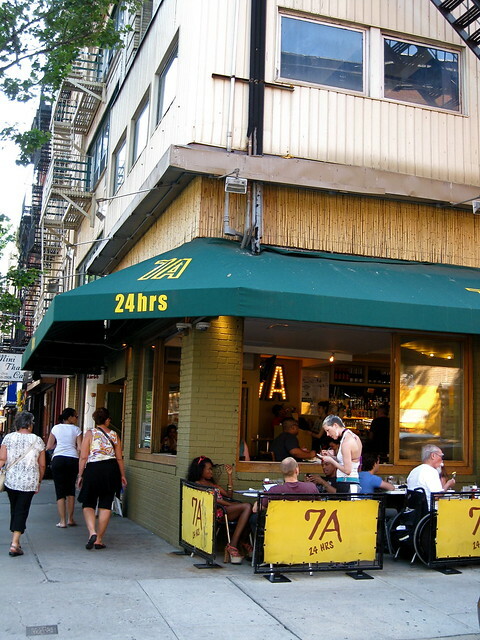 It’s exactly what you need at 2 a.m. – classic, quality diner food to soak up the drinks. Portion sizes are quite good for the price. Our group devoured the guac pretty much as soon as it hit the table. I was so excited to find out about this pie shop. Greg and I got to be big fans of Australia’s favorite street food during our time there. Really, what’s not to like about portable pastries filled with meats for a cheap price. On this round, Greg and I tried the Thai chicken curry pie. I loved the big chunks of chicken, kafir lime, and coconut milk sauce – although I think Greg was a little nostalgically disappointed that it wasn’t stuffed with goopy mash we got a some lesser shops in Oz. 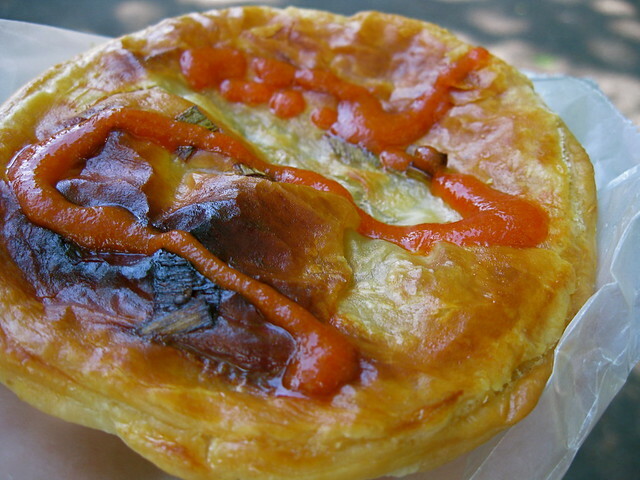 All of the pies are $6 or less, and they’ve got sausage rolls on the menu too. I kind of wish this coffee shop was in my neighborhood so I could just go hang with my laptop. 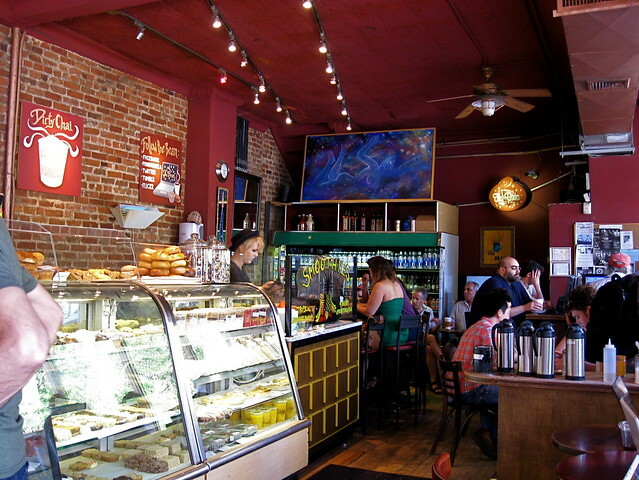 It’s super lively with bright colors, funky art on the walls, and baristas sporting eclectic looks. Greg and I stopped in for a smoothie and a fruit iced tea to help keep us going in the summer heat. 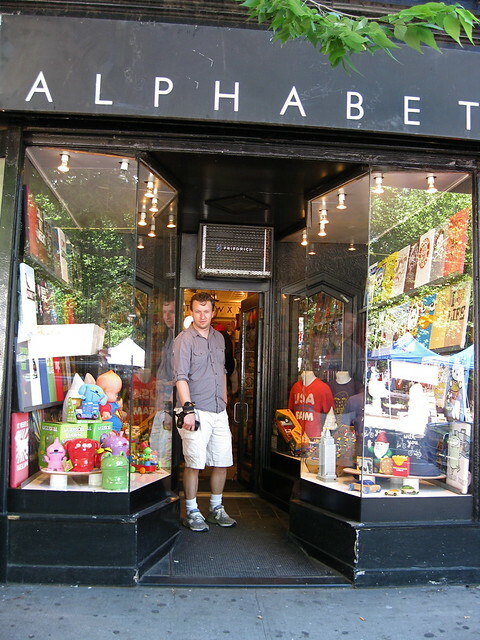 I was seduced by the quirky look of this little shop – or I should say two shops, as the space is split in half. 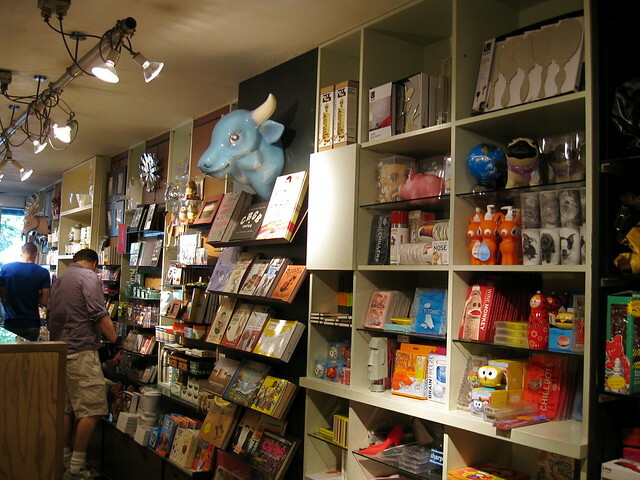 On one side they have toys and offbeat t-shirts. The other side is slightly more high-end version of similarly funky décor and moderately priced clothing. I really dug a lot of the clothes, but in the end I couldn’t resist this Lisa Frank T-shirt with an image right out of my 4th grade sticker collection! 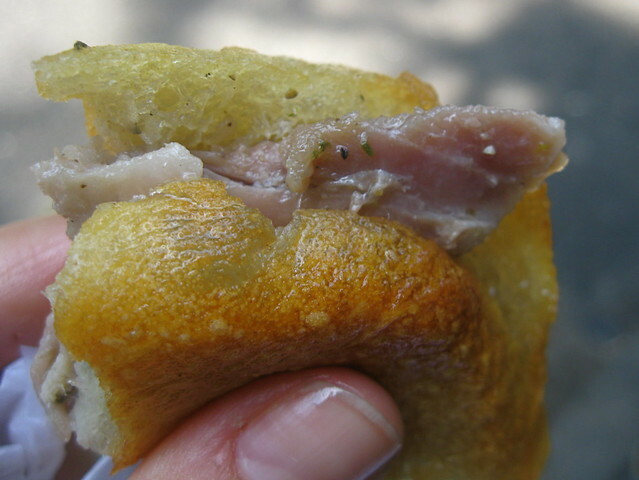 Friends also recommended Crif Dogs and Xi’an Famous Foods, but they’ll have to stay on the to-try list, as there are only so many gut bombs that a girl can have in one weekend. Do you have any other favorite street food stops in the area? 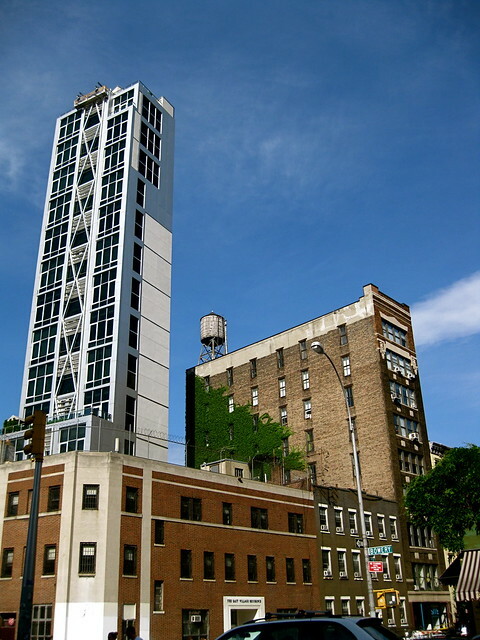 For a bit of the neighborhood's flavor, here's Greg's slideshow from our photo walk. And if you want more pics, you can find my set here. 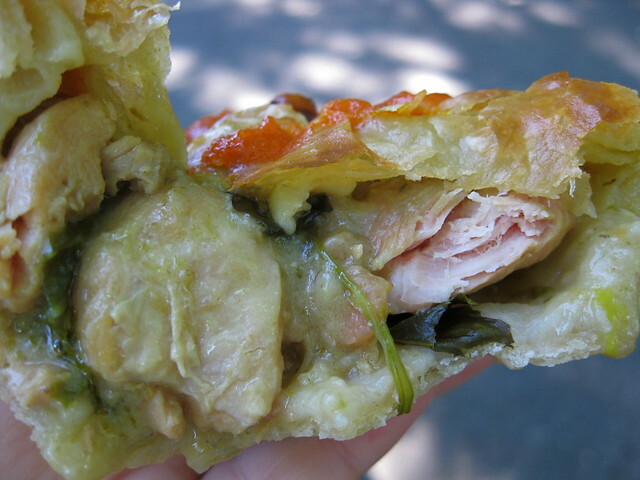 That Thai chicken curry pie made my mouth water. Thank you for sharing.